Well, let’s start with the onion and green onion. In a large skillet heat the olive oil and add the onions. At this point I add some salt and pepper but easy on it since feta cheese is quite salty as it is. Throw in the chopped spinach as well (I used frozen spinach here), pour the juice from half a lemon and add a bit of oregano if you want. Mix everything together for few minutes and then set it aside to cool off. Next is time to get the cheese grated. Add two beaten eggs to it and mix everything very well. After the filling has cooled completely, melt the butter in a small bowl. On a clean surface lay down your phyllo pastry and cover it with a damp towel so that it doesn’t dry out. Take out one sheet at a time, brush it with butter and sprinkle some oregano over it. Lay another phyllo sheet over and brush it with more butter. Using a pizza cutter I cut the dough in 4 pieces lengthwise. Next pour a tablespoon of the filling at the end of each strip. Fold the end at an angle over the filling to form a triangle. This is really a lot of fun, but you have to move fast so that the phyllo dough doesn’t dry out. 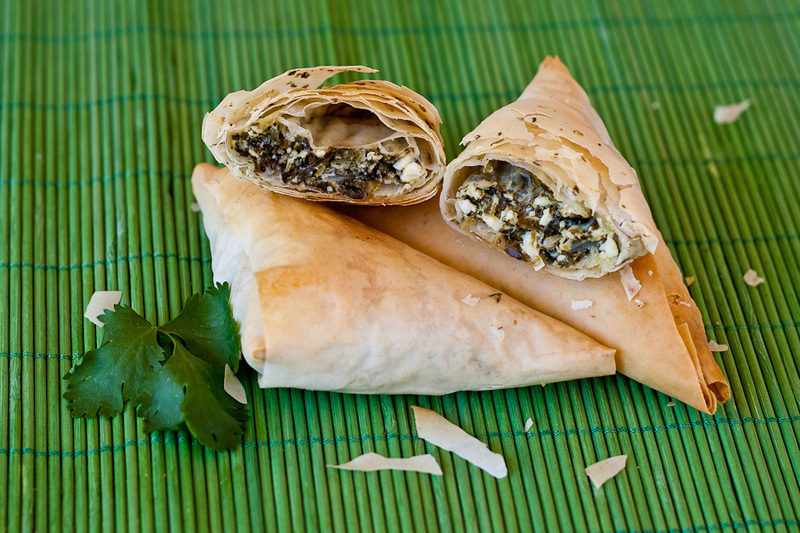 Continue making triangles until you finish all your phyllo dough. When completed, place them on a cookie sheet that’s lightly buttered, I usually just use my silicone mat. Anyway brush some more butter over all the triangles. Bake them at 350° F / 177° C for about 30 minutes or until golden brown, and enjoy. First thing first, we have to assemble the filling. By the way if your phyllo pastry was in the freezer, take it out in time for it to defrost. In a large skillet heat the olive oil on medium heat. Add the onions and saute until soft. Add the spinach and salt and pepper and saute until the spinach is limp. Add the lemon juice and nutmeg, and remove off the heat. Let it cool. If there is excess liquid, place the mixture in a colander and squeeze. Make sure the mixture is completely cooled, otherwise it’s going to make the phyllo dough soggy, and you don’t want soggy spanakopita. In a medium bowl, beat the eggs with feta and nutmeg then add this to the spinach mixture and mix until it’s all incorporated. Preheat oven to 350° F / 177° and brush two baking sheets with some melted butter. Now for handling the phyllo dough, unroll it and lay one sheet flat on your work surface. For the remaining phyllo dough, cover it with a damp towel, so it won’t dry out. Brush the sheet with melted butter, sprinkle some oregano then put a second one on top of it. Using a pizza cutter, cut the sheets lengthwise into four long pieces, about 2 inch (5 cm) strips. 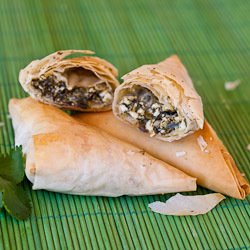 Place a heaping teaspoon of spinach and cheese filling near one corner of the phyllo strip. Fold the end at an angle over the filling to form a triangle. Continue to fold the triangle along the strip until you reach the end, like folding a flag (sort of). Repeat this with the remaining phyllo and filling. Place your spanakopita triangles on your baking sheet and brush with butter, and now you can sprinkle additional Parmesan cheese over them if you wish. Bake them for 20 to 30 minutes until the triangles are golden brown and crisp.